- From a distance these really don’t look too different from the JK. The biggest tell is the front fender vent. The bumpers are decently different too, but visually similar to the current Rubincon Recon and so many Wranglers have custom bumpers on them it’s hard to use as a visual cue. For some reason I didn’t really notice the new headlamps or turn signal locations until I was up close. - I didn’t take too close of a look, but the interior appeared to be a huge improvement. This one had the tan leather seats and they looked fantastic. - I don’t know how this compares in dimensions to the JK spec-wise but any growth appears to have been kept in check. It’s seems pretty close in size, which is fine because the JK was big enough. - The door hinges are boss. - Roof fit and body gaps seem much better than the JK. 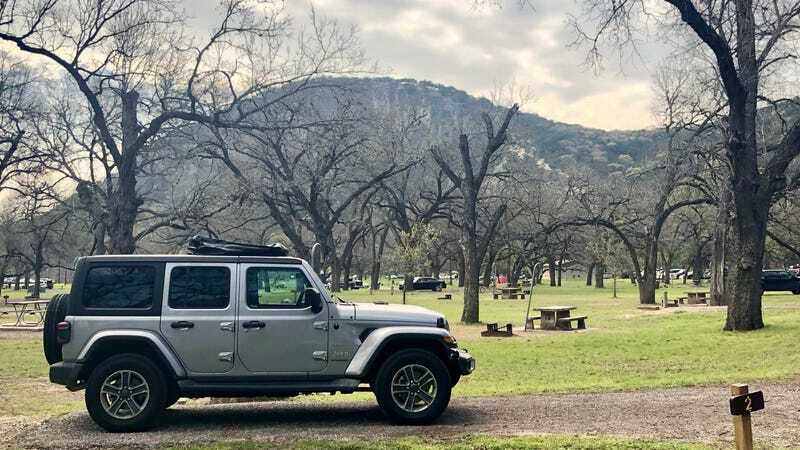 - I don’t know or care what the Jeep purists are saying about it, but with so many ways this redesign could’ve gone wrong Jeep really appears to have nailed it. - Did I mention I want one?